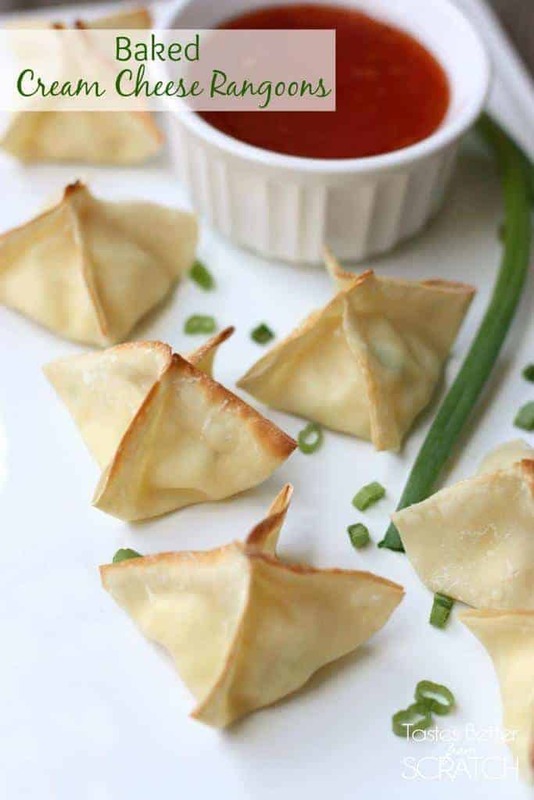 Baked cream cheese rangoons are crispy and cheesy wontons that make a great appetizer. I’m getting soo excited for fall, and football season! Now I’ll let you in on a little secret…I really don’t care that much about football season…I just love having parties and making fun appetizers to enjoy during the game! Don’t get me wrong, I actually don’t mind sitting and watching the game either, but really, it’s all about the food! If you’re looking for some awesome game-day appetizers, don’t miss this roundup of 25+ Fun Party Appetizers! These Baked Cream Cheese Rangoons take minutes to throw together and bake and they’re seriously yummy! They’re so much easier, and healthier than the fried version, and the men in my life like them just as much! Warning, they are addicting, and they’ll be gone quick, so make a bunch! We love to serve them with sweet chili sauce! In a medium bowl, beat cream cheese, garlic salt and green onion until well mixed. In a small bowl, whisk egg until well beaten. Place one heaping teaspoon of cream cheese mixture into the center of a wonton wrapper. 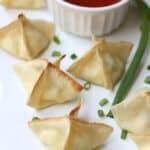 Dip your finger into the beaten egg and lightly coat the outer edges of the wrapper..
Bring all four corners of the wonton together up to the center. Pinch all the sides together to form an "X". 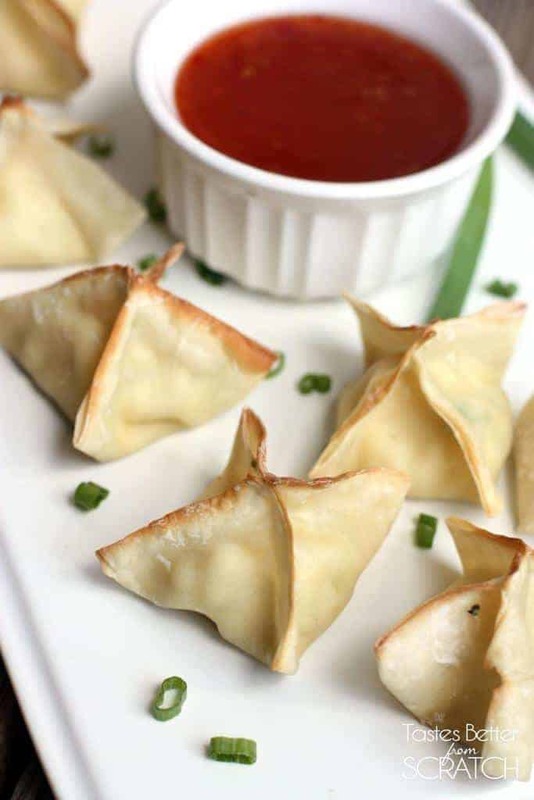 Place filled wontons on a greased cookie sheet. Repeat for remaining wontons and filling. Lightly spray the tops of the wontons with cooking spray to help them brown. Bake at 400 degrees F for 7-12 minutes or until tops are golden brown. Serve with sweet and sour sauce, if desired. This is one of my favorite things about going out for Chinese! I’m totally excited to try these! Thanks lady! Ooh! I want some! Sounds so good! I order these everytime I go to Panda Express! so happy to have the recipe now! mmm I love cream cheese rangoons, but haven’t made them baked. I need to try these! I can’t believe how easy these are! I can’t wait to make them! Hi Kathy, we like to serve them with sweet and sour dipping sauce!